While we are at the tail end of the summer season, the Fort Worth heat still persists. It is important that you don’t neglect your grass during the hotter months. Brown and dry patches can indicate that something is amiss. Blooms Landcare has some simple tips on how to keep your grass green and healthy in the Fort Worth heat. 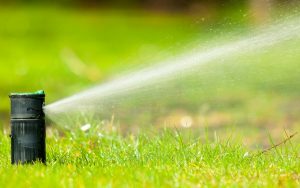 The most efficient use of your water is to hydrate your grass early in the morning. In the morning hours, the weather is cool enough for the water to soak into your soil, rather than evaporate off into the air. Watering your lawn frequently is not as effective as doing a longer watering session. When you water for a longer length of time, the water can soak into the soil deeper, keeping that water from evaporating off quickly. This will keep your grass well hydrated and green, no matter the temperature outside. Make sure to water your lawn at least once or twice a week for about 20 minutes. If you start noticing some puddles forming, you can cut back on the length of time. It is great to fertilize your lawn in the spring season before the heat sets in. However, over fertilization can damage your lawn in the summer. It also can encourage weed growth. Test your soil’s pH levels and fertilize accordingly. If your grass is still not as healthy as you would like, call a professional landscaping company for help. They have experiencing in maintaining a perfect lawn in the Fort Worth heat. For more information about how to keep your grass green in the Fort Worth heat, call Blooms Landcare today! Dial (817) 688-5352 to schedule your appointment with one of our landscaping experts. Next Next post: How Much Mulch Do I Need?